To make the spice rub, process the black peppercorns, coriander seeds, piment d’espelette, ground cinnamon, grated nutmeg and bay leaves in a spice grinder or mortar and pestle. Note: We recommend marinating the meat overnight. Purée the chopped onion, chopped garlic, olive oil and sun-dried tomatoes in a blender or processor. Pour half of the marinade into a baking dish and spread evenly. Sprinkle the spice rub onto one side of the pork chops. Place the seasoned side down in the baking dish, then use the remaining marinade to cover the pork chops. Sprinkle the rest of the spice rub. Cover and place in the refrigerator overnight. In an eight-quart pot, bring the chicken stock, milk and salt to a slow boil. As the liquid begins to boil, add the polenta and whisk continuously until combined, about three minutes. Turn the heat down to low, then cover and cook for 45 minutes. Occasionally stir with a whisk and scrape down the sides with a rubber spatula every five to ten minutes. Remove the polenta from the heat, and stir in the Comté cheese. Check seasoning and add salt, if needed. Preheat the grill to medium. Season the marinated pork chops with salt, then grill one side for about five minutes. Turn the pork chops over and cook the other side for another five minutes. Allow the chops to rest on the grill for five to ten minutes over indirect heat, which allows the meat to caramelize and almost char because of the natural sugars in the marinade. Spread a generous dollop of polenta across the plate, with the warm kale salad placed to its side. Take your beautifully grilled pork chop and lay it across the polenta and kale. 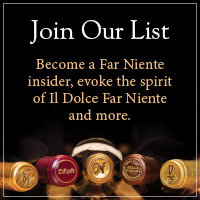 Pour yourself a glass of Far Niente Cabernet Sauvignon!